Hey friends! 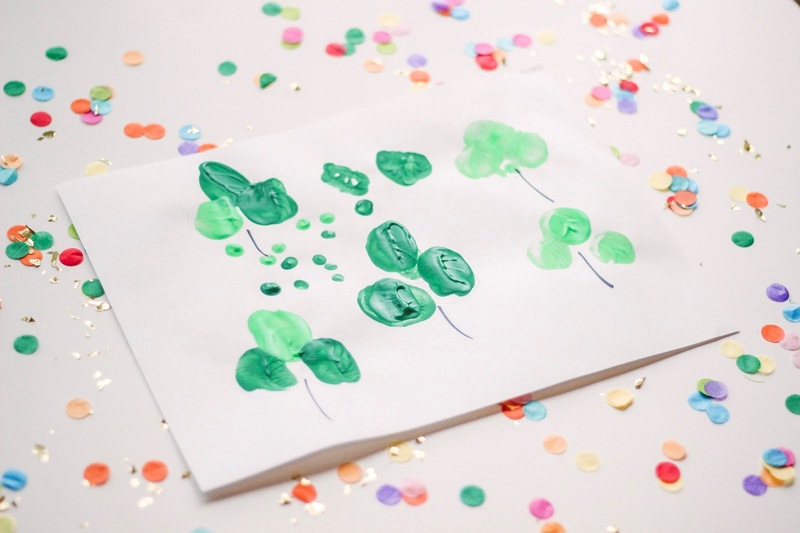 Today I'm going to wrap-up a week of festive St. Patrick's Day posts with some fun and EASY activities you can make or create with your little leprechauns! I found majority of these ideas on Pinterest, take a peek at my board full of St. Patrick's Day fun! 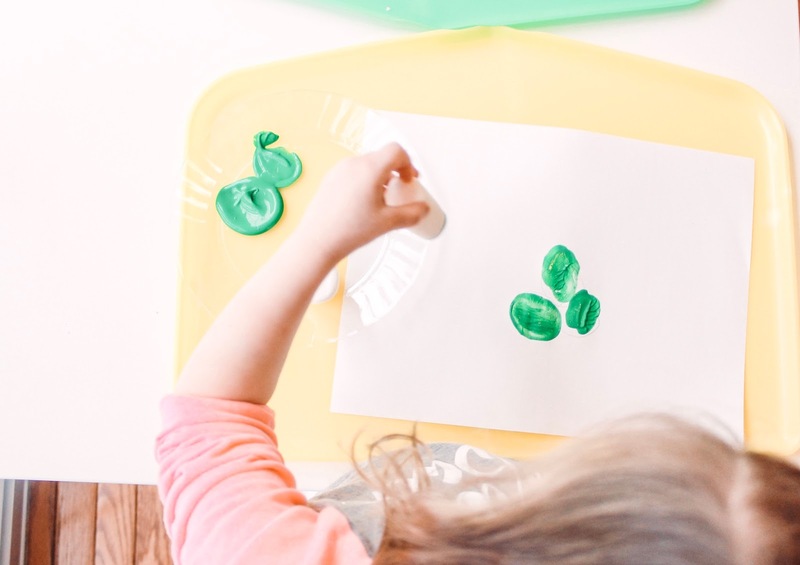 Marshmallow & Pepper Stamping- The little ladies LOVED this one, well honestly, they loved all of these activities, but the marshmallow stamping in particular was a big hit! I started off drawing three circles in a "clover" shape for them to stamp, just a little model on how they could create a clover and Emmy was loving it! Avery was a big fan of stamping the rainbow, I literally used a pencil to make some rainbow lines and she filled in all the colors. 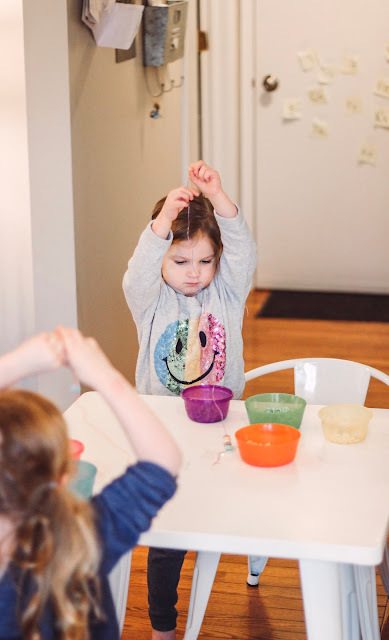 I got super lucky and Target had a ton of washable Crayola paint on clearance so I bought every single color they had, I think each one was less then a dollar!? Also, do yourself a favor and buy some of these plastic trays from Amazon, they make cleaning up after art projects SO easy and have a little edge to them, so if anything spills it doesn't go running off the table! 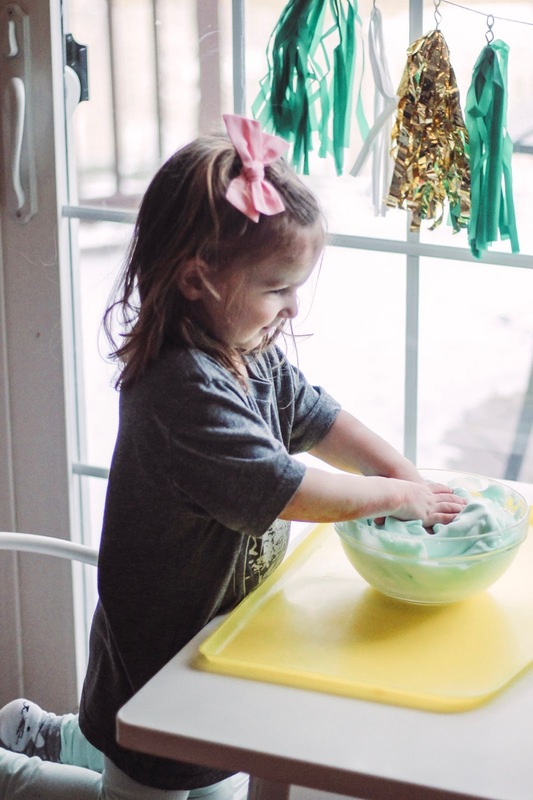 Heart Made Dough- My girls love playing with play dough, especially Emerson! 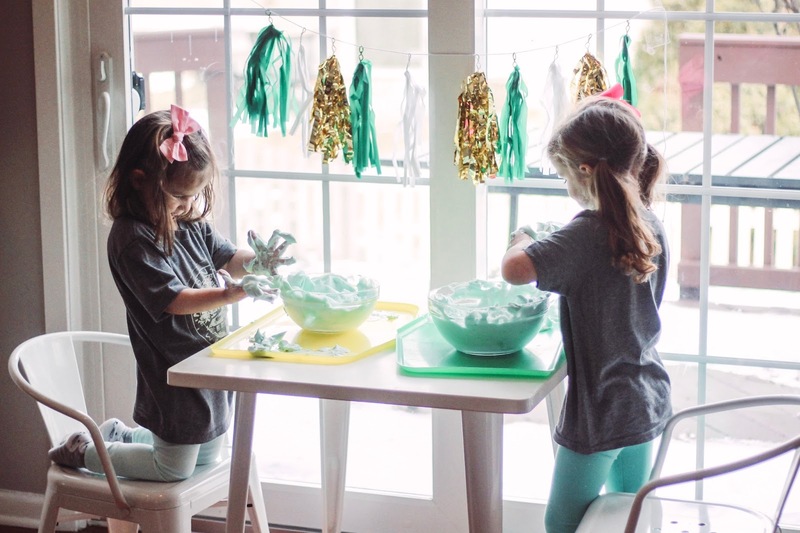 A former college classmate started her own natural play dough business, Heart Made Dough with her sister and we are BIG fans. 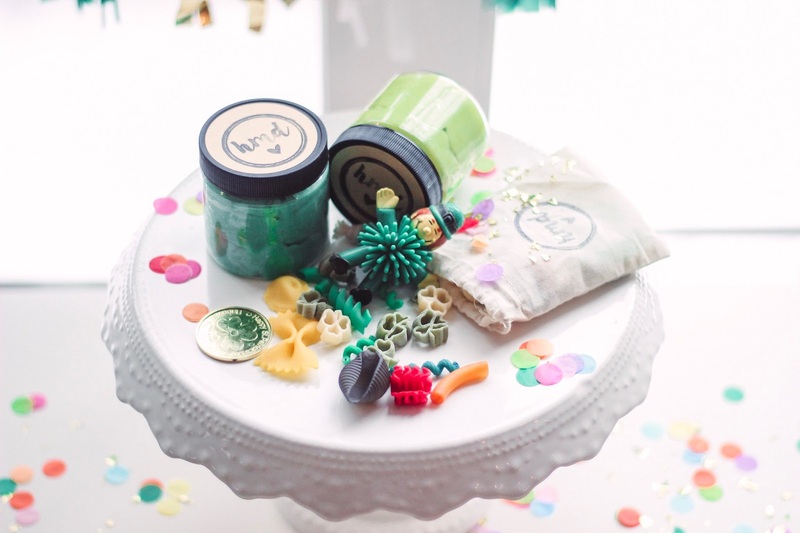 Each month they release a new themed scented dough AND donate part of their proceeds to a different charity each month. 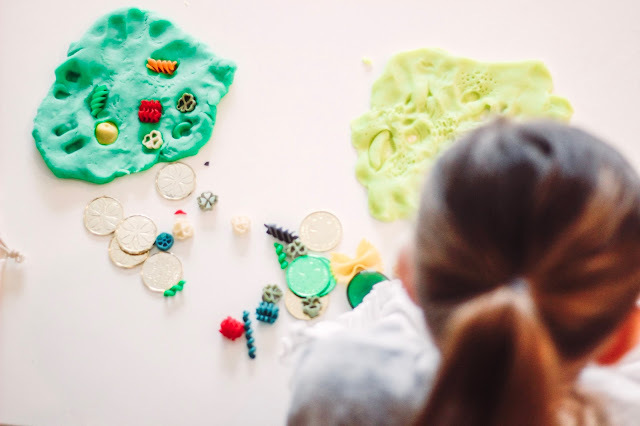 Last month they added play-kits as an optional add-on and they are packed with all sorts of fun little treasures to play with! The March dough is named "Happy Dough Lucky," comes in two shades of green and smells like marshmallows (think Lucky Charms)! 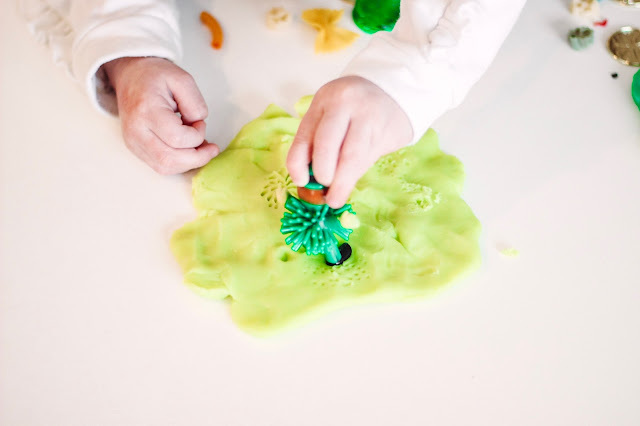 Emmy had the best time taking her leprechaun to the beach, making him lunch and putting him to bed, we loved a morning filled with imaginative play. 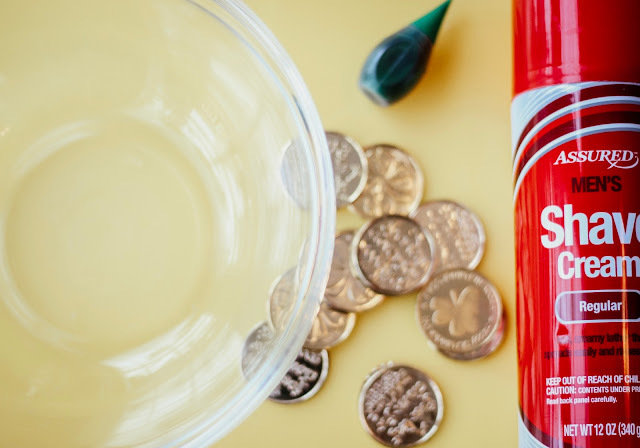 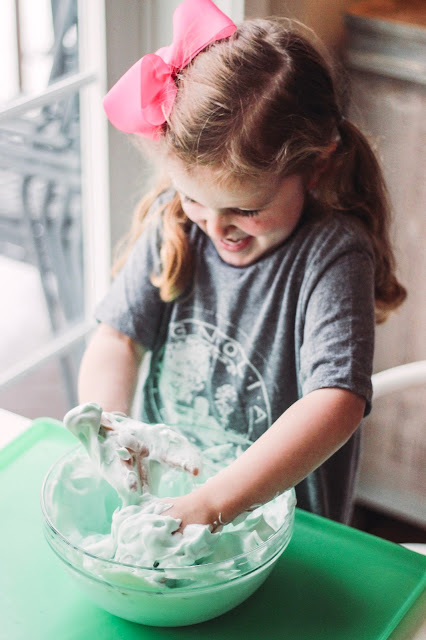 Shaving Cream Hunt: While this activity was a messy one, the girls had the best time digging around (green) shaving cream, hunting for all the gold coins! 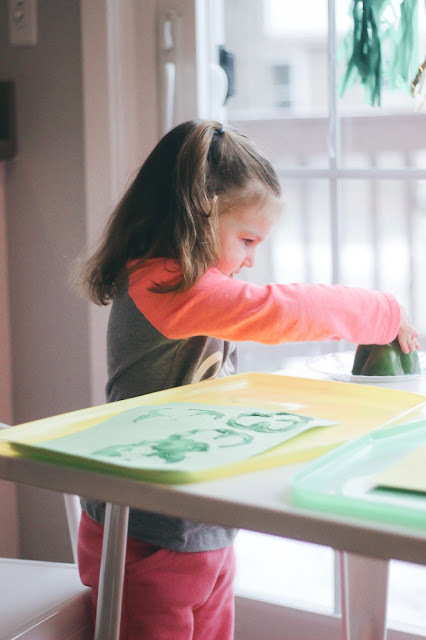 As long as you use a tray and just take a few deep breathes before hand, ha, the clean-up for this one wasn't bad and the girls LOVED it. I picked up the gold coins and shaving cream at the Dollar tree, added a few drops of green food coloring, mixed everything up in the bowls and let the little ladies dig in! 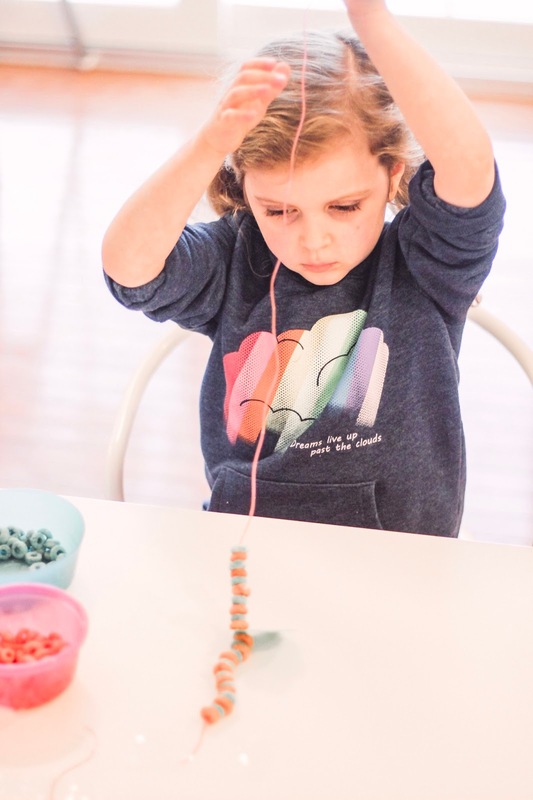 Fruit Loop Rainbow Necklace: My little ladies love dressing up for the holidays AND really love any kind of jewelry to "fancy" up an outfit. 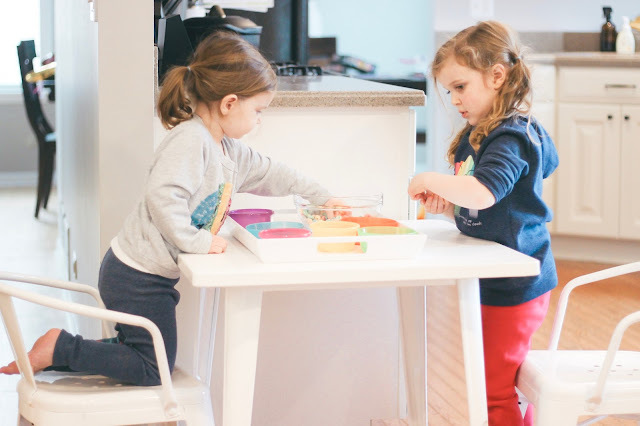 When I saw this idea on Pinterest, I knew it would be a win for my little ladies. 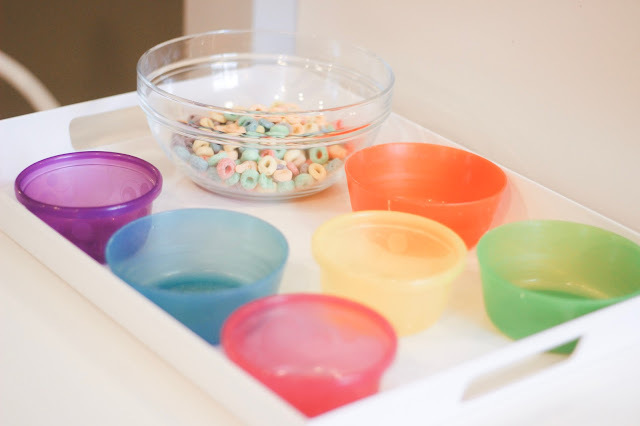 First, I dumped a big box of Fruit Loops into a bowl, grabbed coordinating colored plastic bowls and had my ladies sort the loops by color. 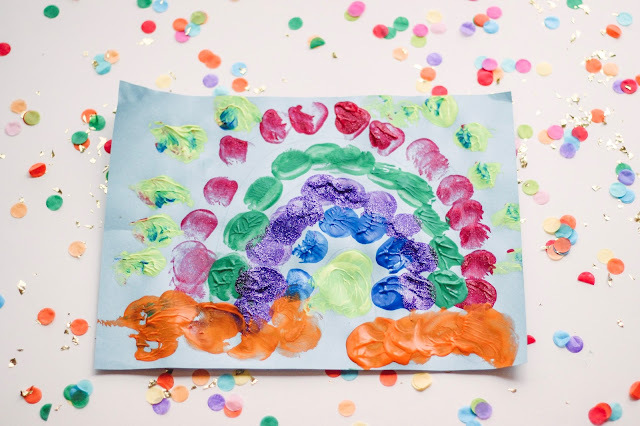 They did such a great job with this and Emmy saying the word "orange" is one of my favorite things EVER! 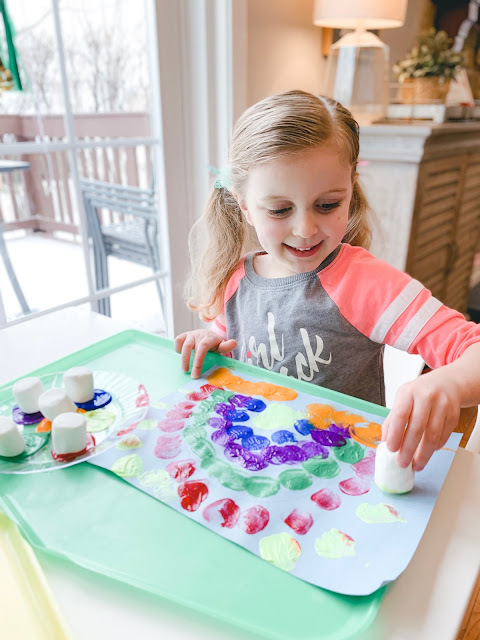 This is also a great activity to encourage them to follow a pattern, Avery was especially great at that. 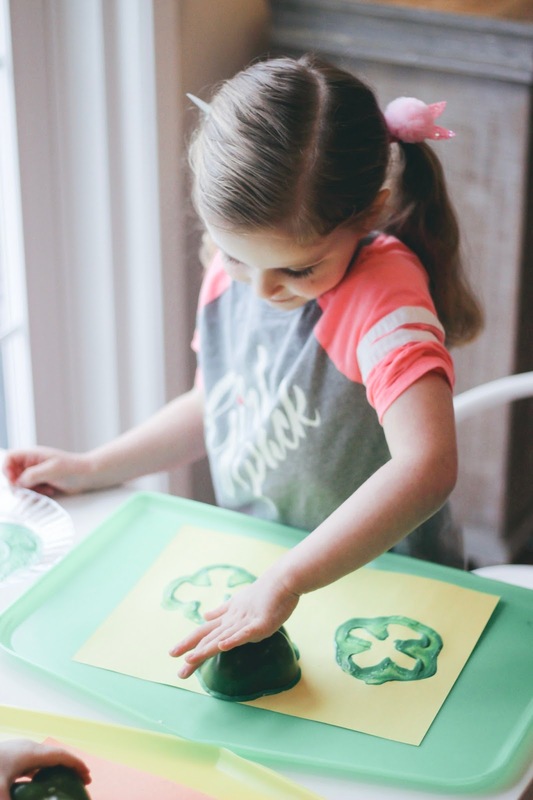 We use a shamrock cookie cuter to outline to shape of a shamrock and Avery wrote their names on each "charm." 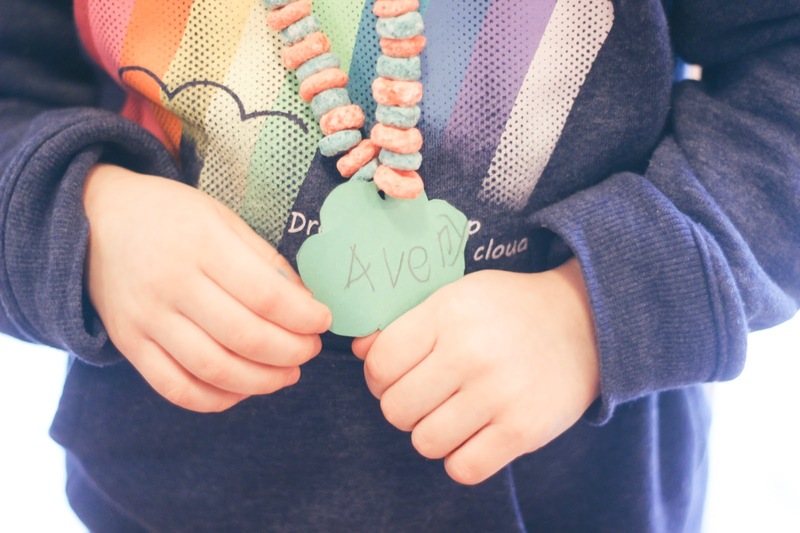 We have plans to make these necklaces for a few of our "lucky" friends too. 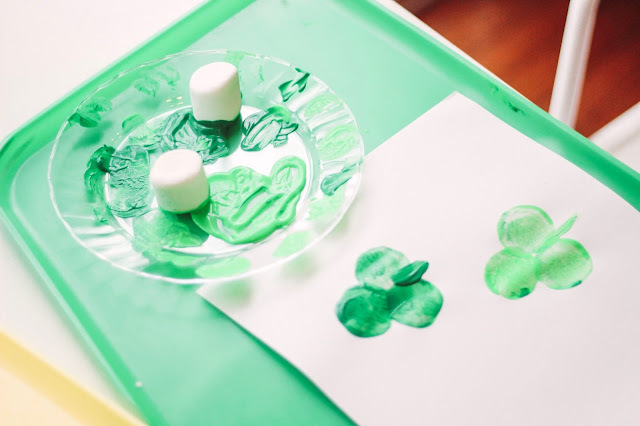 I hope you can squeeze one or two of these EASY activities to celebrate St. Patrick's Day with your kiddos! 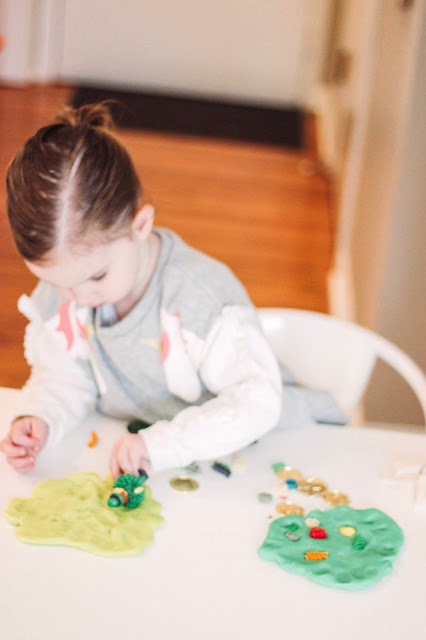 We are a tad, ok maybe a lot, holiday obsessed over here, but it just makes life that much more FUN when you find just about any reason to celebrate. 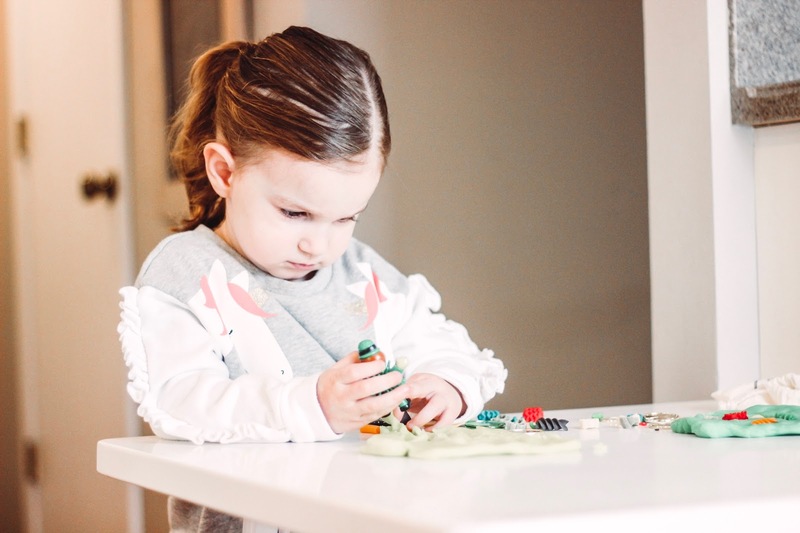 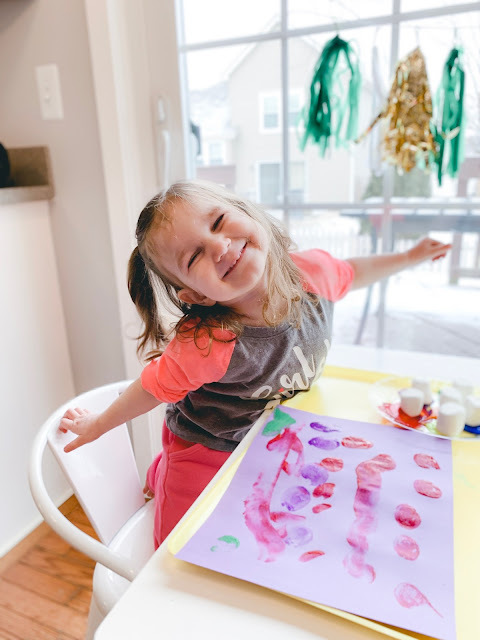 As you can see, it doesn't take much to add a little festive fun to your week, let me know if you try any of these activities, I know your kiddos will love them and maybe you'll be able to sneak in a few sips of hot coffee while they play, Happy Monday Mama's! 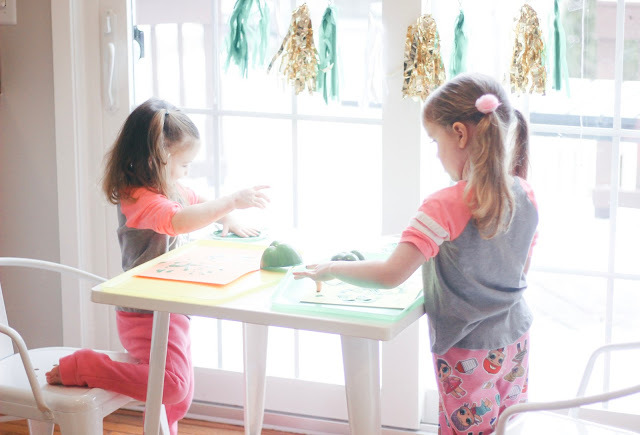 Well these are just the cutest ideas ever! 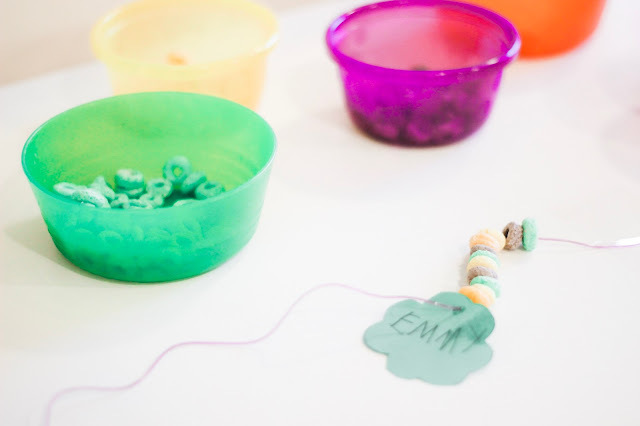 I'm definitely going to have to try the fruit loop necklaces and the marshmallow stamping - my girls would love these!